How might your converter affect your air conditioner? You might be surprised! Convertors take your shore power ( or the power you get when plugged into your house/rv park ) which is AC power and “convert” it to DC for use around the RV. An RV converter will also have battery conditioning circuits which charge/discharge the battery and handle when shore power is disconnected and power needs to be taken OUT of the batteries instead of being stored IN the batteries. Converters, and the power conditioning are also some of the most problematic areas of an RV. The converters can get hot and if very old, or poorly made can catch fire or cause wires in your RV to catch fire. I've only been living full time in an RV since 2010. Since then I've known personally of two fires in RV's which were directly attributable to the power converter. One was due to age, and the other one was new so no explanation. 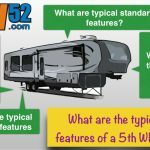 RV Basics – What is a Travel Trailer RV and what are its basic features? RV chassis battery dies when RV plugged into shore power. Why? Xantrex Tech Doctor™ - What is a power manager? Xantrex marketing manager Mitul Chandrani asks Tech Doctor Don Wilson to explain power management system in RVs and boats. Can I connect an WFCO 55 Amp power converter RV 52 straight to the vehicvle batteries to run all the 12 volt system? Or do I need to get a separate battery for it? I am making a camper out of a 1998 FOrd Econoline Van 7.3 Diesel, 24 volts and when it come to this part I have no clue. Please help will be greatly appreciated. I’m not an expert, but I think you would want a separate battery. To run lights and things, those batteries are usually deep-cycle batteries which are designed to better handle lower in/out currents. For starting your beast, usually those batteries are designed for pure cranking power. I just bought a Power Dynamics converter to replace my WFCO. I’ve been thinking about this and you are way beyond me. I think you are right. Since your system won’t have the DC systems split out like an RV, probably an extra battery doesn’t make sense. If you want, I’ll contact Roadtrek and/or Pleasure-way and ask them to see what they say. They’ll certainly know the answer.